Australian NBA guard Matthew Dellavedova has taken out a commentator in a trademark display of his hustle. 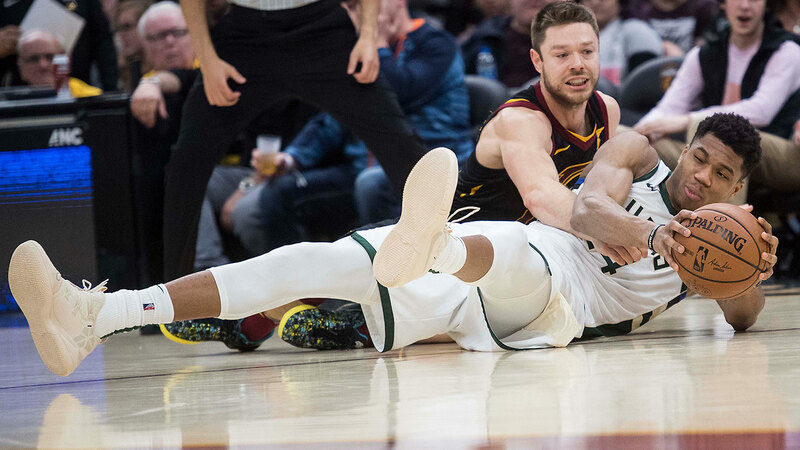 Dellavedova was attempting to retrieve a loose ball when he dived over the commentary table, taking out Fox Sports Ohio’s Fred McLeod, during Cleveland’s home contest against the Milwaukee Bucks. Incredibly, the fiesty Australian not only saved the ball, but got it back in time to his teammates before charging back into the Cavaliers’ offensive set. Despite being a foreign-born player, Dellavedova has gained incredible popularity in the city of Cleveland following his heroic exploits against league MVP Stephen Curry during the 2015 NBA Finals, and efforts such as today are exactly what has endeared him to Cleveland fans. Unfortunately for Dellavedova and the Cavs, the Bucks were simply too talented for the home side despite a spirited performance, prevailing in a 114-102 win at Quicken Loans Arena. MVP favourite Giannis Antetokounmpo was unstoppable all night, finishing with a season-high 44 points to go along with 14 rebounds and eight assists on an incredible 14-of-19 shooting night. Dellavedova continued his good play since his trade back to Cleveland, tallying 10 points, three rebounds and five assists in 27 minutes of action. The 28-year-old has enjoyed tremendous success scoring in double-figures in each of his three games back with the Cavaliers.